Höj ett glas till den växande vinregionen i Niagara-on-the-Lake under denna 6-timmars vinutflykt i områdets växande samling vinmakare. Utforska fyra prisbelönta vingårdar i hjärtat av vad som nu är känt som Kanadas Wine Belt, och njut av gratis provningar vid varje stopp och gott om möjligheter att köpa dina favoritflaskor. Du har också tid att sluta köpa lunch på lokal matställe, turnera och smaka prover på en chokladfabrik. En förare-guide, buss eller turnébil, samt entréavgifter ingår alla. Besök fyra prisbelönta vingårdar i hjärtat av vad som nu är känt som Kanadas "Wine Belt"
We had a wonderful time and our tour guide Joe was the best! We absolutely loved him. I would definitely love to do this again. 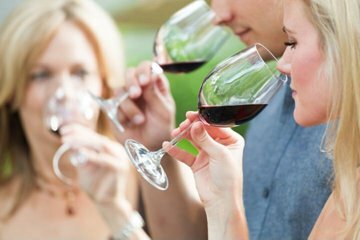 If you love wine and want to learn more about different types, this is the tour for you. The tour guide (Joe) was very knowledgeable and friendly. No rating as we missed it, because it was so far from Toronto and we didn't know, but we were still able to do a winery with our tickets with Niagara Falls at night so this made up for it. Well worth the price, a very entertaining and fun day with Joe! All tastings included in price, plus a great place for lunch. Both of us agreed we'd do it again anytime!! A great time had by all. Don't do it!! !Could not contact anyone by phone... Missed the pick up,,,,,,waste of money!!!!! Our guide was great. Joe had a sense of humor. The wine was wonderful. All the wine stops educated us on different aspects. Wished our bonus stop was the chocolate factory as the ticket said instead of the peanut place. Lunch in Niagra on the falls was not really something to brag about. Very enjoyable trip and driver who was a good host. Lots of good laughs and lots of excellent wine to taste. Thoroughly enjoyed the lunch stop at the barn market - really good assortment of tasty salads at the salad bar. The tour as a whole was great. The best stop was the second stop.